You are here: Home › Salut Reflections › The decline and fall of the Sunderland empire. Is there a way back? The decline and fall of the Sunderland empire. Is there a way back? Why are SAFC no longer a top club? 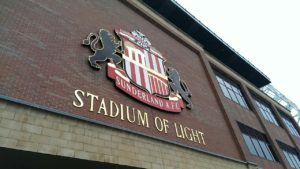 The glory days of SAFC are now long gone and, as the club has continued a downward trend, fans have been left to wonder how this came to be and how it can be changed. Back in the 1950s, Sunderland AFC was a name to look out for in English football with an identity and financial stature to match. There were four top 10 finishes, including third and fourth positions, between 1950 and 1956. Unfortunately, the club could not maintain this level of achievement and the downfall began, starting with a damaging improper payments scandal, in 1957. Among the list of SAFC legends, Trevor Ford, Ray Daniel and Ken Chisholm still claim places in the club’s hall of fame, reminding fans that Sunderland have known much better days. And indeed, as soon as that generation started to fade out, the overall level of SAFC performance systematically declined and the 1958 relegation – Sunderland’s first after 68 years of playing only in the top flight – was followed by six years in the old Second Division. This 1950s generation of football talent had been indirectly responsible for the club’s plight. As their performance on the field had become better and better, these remarkable players needed proper remuneration and, anxious to preserve Sunderland’s status as a leading club, the leadership sought to compensate them in illicit ways. What the club did was to introduce under-the-counter bonus schemes. Of course, SAFC fans had been entirely unaware of what had gone on, concerned only to see their team succeed. Much like with any respectable football bets today, the team’s odds began increasing from one match to another, and everything seemed to work flawlesly for SAFC until it all began to unravel. Rumours started to circulate, eventually reached the ears of the FA and an inquiry was launched in 1957. Although similar payments were undoubtedly being made by other clubs, the man who blew the whistle on Sunderland was identified only as Mr Smith. He may have been a disgruntled insider. No one appears to know for sure. All the same, his complaint attracted the attention of the FA secretary at that time, Alan Hardaker, who started looking into the club’s financial operations. Getting nowhere, and on the point of abandoning the inquiry, he discovered one particularly weird £3,000 receipt for straw to cover the playing surface as protection against harsh winters. A chat with his brother, Ernest, Hull’s rugby league chairman, suggested that such an amount of straw would be enough for 25 football seasons. It was a bogus receipt, covering up the extra money being paid to players. Sunderland received a record fine of £5,000, the biggest to have been applied to a football club up to that time. The chairman, Ted Ditchburn, assumed full responsibility but the club’s vice chairman and another director joined him in being permanently banned from the game. Five players – Daniel, Chisholm, Billy Elliott, Willie Fraser and Johnny Hannigan – were also banned indefinitely, though their punishments were reduced when they finally admitted receipt of improper payments. That was the precise moment that determined the fate of SAFC. Despite a new board and transfers that brought young and talented additions to the team, the damage had been done. After landing in the Second Division, the club finished 15th at the end of the first season in the lower league, a source of much of disappointment and anger to supporters. At last, Sunderland began to push for promotion back to the First Division, very nearly managing it in 1963 and going up in second place (behind Leeds United) a year later. But it was not to prove the catalyst for a return to glory days. Instead, Sunderland supporters have endured more than half a century of underachievement, punctuated by occasional promotions (necessarily following relegations) and Wembley appearances, notably the 1973 FA Cup final win over Leeds, then established as a force in English football. What has been missing is any period of real stability in the top flight. Except in seasons when promotions have been fought for and sometimes achieved, and two top seven Premier League finishes under Peter Reid, fans have had to put up with year after year of performances ranging from mediocre to downright disastrous. Can Chris Coleman build on a creditable start to his managership of the club – all the more impressive, despite some poor defeats, considering the utter mess he inherited – and lead Sunderland back to the top? The crowds may be smaller, at least for now, but the fans remain passionate, rooting for their team and hoping SAFC will at least rise towards the heights reached in a glorious past. “The decline and fall of the Sunderland empire.” This could be about the theatre on High Street West. In the meantime, let us celebrate the survival of our club, which many others have not achieved, and enjoy the spectacle of sportsmen, far better than ourselves, playing with real passion whilst representing The Lads. As that old character Fraser used to say on Dad’s Army. “We are doomed!” It always sounded funny when he said it. The situation at SAFC isn’t funny at all but it is terminal.